Killer Klowns From Outer Space was just released on Blu-Ray, which gives me a perfect excuse to review one of my all-time favorite movies. I'm not afraid of clowns, but this movie made me understand why anyone would be. Just like all great B-movies, the title says it all. The movie is about a spaceship full of aliens that look like demented clowns that visit a small town and start killing people. It's the execution that makes this movie great. The clowns use an assortment of clown and circus-related tools to terrify the populace. They cocoon victims in cotton candy, melt them with cream pies, and use balloon animal dogs to hunt them down. At times, it's genuinely funny in the same macabre way that we laugh when the Joker kills someone with an electrified joy buzzer. 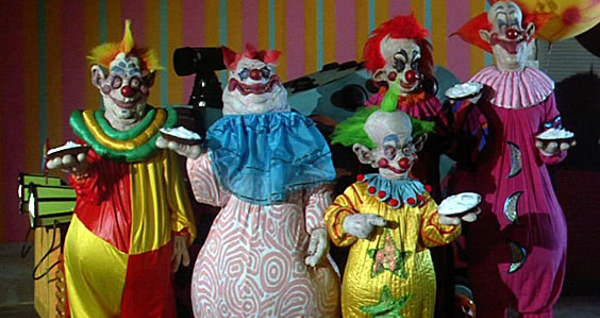 Killer Klowns is smartly written for a B-movie. There are the standard horror movie characters - the guy and his girlfriend, the ignorant sheriff, the hapless farmer - but they all come off as knowing winks at the genre. For instance, it's the girlfriend who figures out what's going on, not the boyfriend. The writers even came up with a semi-plausible explanation for the bizarre premise: what if these aliens visited Earth long ago and that's where we got the idea of clowns? The production design is what's takes Killer Klowns over the top. The Chiodo Brothers, the movie's writers and directors, are visual effects artists, and it shows. The make-up and costuming is fantastic in the horrifyingly exaggerated portrayal of clowns. Really, this movie is better than it has any right to be. Compare this movie to the truly awful evil clown movie, Killjoy, and you'll see why it gets high praise. I watched it in the 80's, but it's been so long I don't remember it well. It does deliver exactly what it promises: Killer Clowns from Outer Space. It seems like the kind of premise Ed Wood might have come up with.